Dallas Vintage Shop has this Star Wars, Obi-Wan Kenobi Supreme Quality Costume or other outfit options for Obi-Wan. We have the biggest selection of Star Wars Costumes in the Dallas, North Texas Area. Get Obi-Wan outfits for Star Wars Episodes I, II & II or for young Obi-Wan, Ewan McGregor or original Obi-Wan, Alec Guinness. Get all your Star Wars Movies Characters Outfits here. 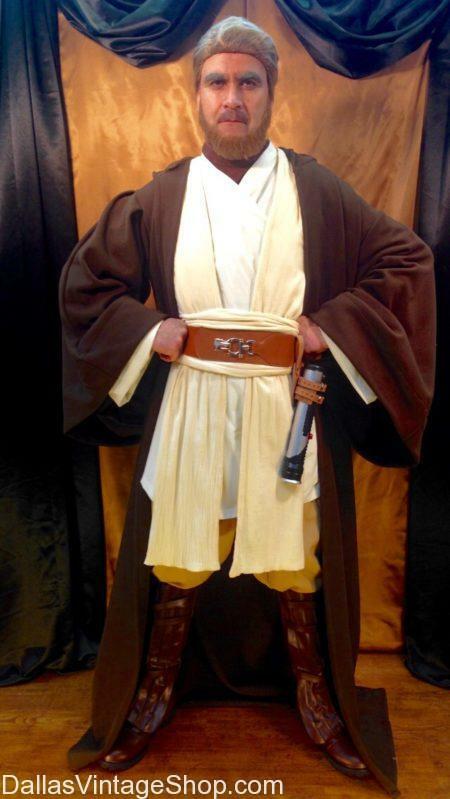 You will find Obi-Wan Kenobi & any other Star Wars Characters Outfits at Dallas Vintage Shop. This Ewan McGregor, Obi-Wan Premium Quality is the highest quality. We have Star War Characters Costumes for Ladies, Men, Girls & Boys in a variety of price points. We are the Dallas, DFW & North Texas Costume Super Store. Get all your Star Wars Movies Characters Outfits or any other Blockbuster Sci-fi Movie Characters Costumes & Accessories here. If you need Cosplay Costumes, Action Characters, Hollywood Greats, TV or Movie Characters or Halloween Costumes for Theme Parties, there is no better place in Dallas or the DFW Metroplex to find complete outfits or just the Ladies Wigs, Men’s Wigs, Makeup and Accessories you need. We have all your favorite Star Wars Characters, like this ‘The Force Awakens’, Quality Star Wars, Rey, Daisy Ridley Costume In Stock at. Get all your Star Wars Movie Characters Outfits or May the 4th be With You Star Wars Celebration Costumes. We are Star Wars Costume HQ for the Dallas, DFW & North Texas Area. You will find this Star Wars, The Force Awakens, ‘Rey,’ Quality Costume many other Star Wars Characters Outfits at Dallas Vintage Shop. This is one of our many Premium Quality Costumes we have in stock at Dallas Vintage Shop. We have tons of other Star War Characters Costumes for Ladies, Men, Girls & Boys in a variety of price points. We are the Dallas, DFW & North Texas Costume Super Store. Get all your Star Wars Movies Characters Outfits or any other Blockbuster Sci-fi Movie Characters Costumes & Accessories here. If you need Cosplay Costumes, Action Characters, Hollywood Greats, TV or Movie Characters or Halloween Costumes for Theme Parties, there is no better place in Dallas or the DFW Metroplex to find complete outfits or just the Ladies Wigs, Men’s Wigs, Makeup and Accessories you need. 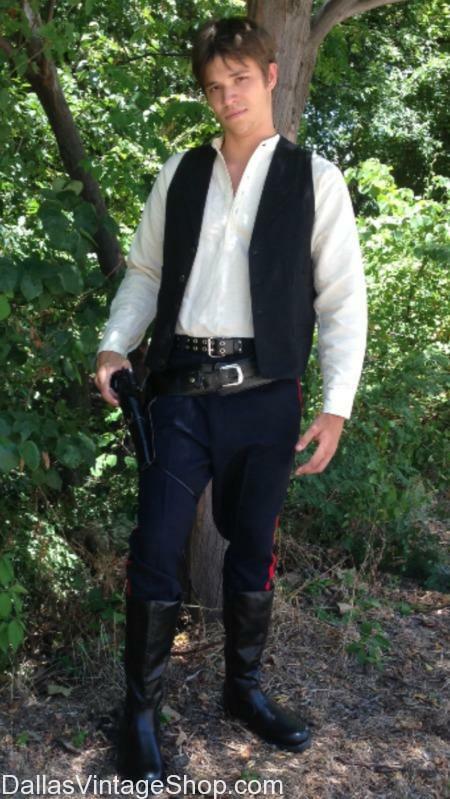 This Hans Solo, STAR WARS, Harrison Ford Quality Costume is just one of many great Star Wars Characters Costumes we keep in stock. What’s your favorite Star Wars Episode? We have Outfits for all those Characters too. Find Hans Solo & any other Star Wars Characters Outfits at Dallas Vintage Shop. We are the Dallas, DFW & North Texas Costume Super Store. Get all your Star Wars Movies Characters Outfits or any other Blockbuster Sci-fi Movie Characters Costumes & Accessories here. If you need Cosplay Costumes, Action Characters, Hollywood Greats, TV or Movie Characters or Halloween Costumes for Theme Parties, there is no better place in Dallas or the DFW Metroplex to find complete outfits or just the Ladies Wigs, Men’s Wigs, Makeup and Accessories you need. We have this Star Wars Princess Leia, Carrie Fisher, New Hope White Dress Princess Leia Costume in stock. Get all your Star Wars Movies Characters Outfits or Cosplay Costumes for May The 4th Be With You Celebrations, we’ve got all you need. When you want a Star Wars Princess Leia, Carrie Fisher Costume or any other Star Wars Characters Outfits at Dallas Vintage Shop. This New Hope White Dress Costume is just one of many great Star Wars Series Classic Outfits in store for you at Dallas Vintage Shop. We have Star War Characters Costumes for Ladies, Men, Girls & Boys in a variety of price points. We are the Dallas, DFW & North Texas Costume Super Store. Get all your Star Wars Movies Characters Outfits or any other Blockbuster Sci-fi Movie Characters Costumes & Accessories here. If you need Cosplay Costumes, Action Characters, Hollywood Greats, TV or Movie Characters or Halloween Costumes for Theme Parties, there is no better place in Dallas or the DFW Metroplex to find complete outfits or just the Ladies Wigs, Men’s Wigs, Makeup and Accessories you need. 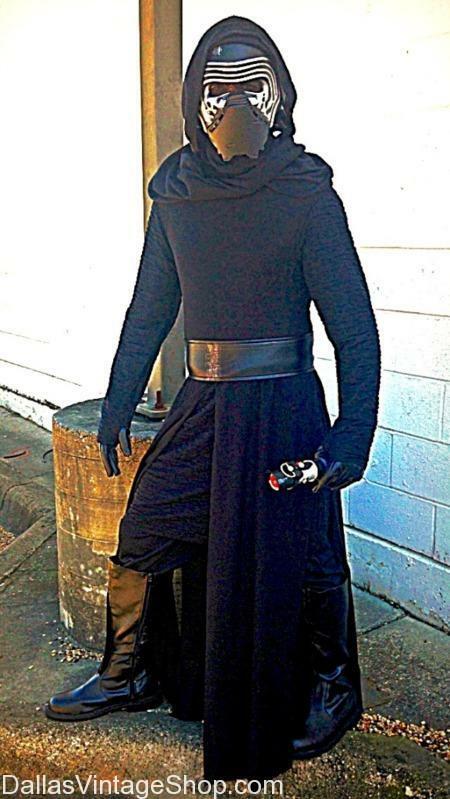 Get this Kylo Ren, Star Wars Evil Sith Lord Costume & Helmet at Dallas Vintage Shop. We have this Star Wars, Kylo Ren Quality Costume or other Star Wars Characters Costumes. We have a large selection of other Star Wars Villains or Heroes Costumes in stock to serve the Dallas and all of the North Texas Area. Get all your favorite Star Wars Episodes Costumes. Are you ready for May the Fourth Be With You Star Wars Celebratios & Star Wars Theme Parties? What is your favorite Star Wars Movies Character? Kylo Ren and all the other Sith Lords are waiting for you here. You will find Kylo Ren from The Force Awakens & many other Star Wars Characters Outfits at Dallas Vintage Shop. This Kylo Ren, Star Wars Evil Sith Lord Costume & Helmet is available now. We have lots of Star War Characters Costumes for Ladies, Men, Girls & Boys in a variety of price points. We are the Dallas, DFW & North Texas Star Wars Costume Super Store. Get all your Star Wars Movies Characters Outfits or any other Blockbuster Sci-fi Movie Characters Costumes & Accessories here. If you need Cosplay Costumes, Action Characters, Hollywood Greats, TV or Movie Characters or Halloween Costumes for Theme Parties, there is no better place in Dallas or the DFW Metroplex to find complete outfits or just the Ladies Wigs, Men’s Wigs, Makeup and Accessories you need. We have Star Wars Costumes Galore at http://dallasvintageshop.com/! This Star Wars imperial Soldier iis your average, stereotypical Stormtrooper in White Costume. Stormtroopers are a branch of the Galactic Empire’s military. The stormtroopers, the Empire’s elite shock troops were organized under the Stormtrooper Corps, which operated as part of the army. When it comes to Star Wars Characters Costumes the One Stop Shop for the Dallas, DFW or North Texas Area. 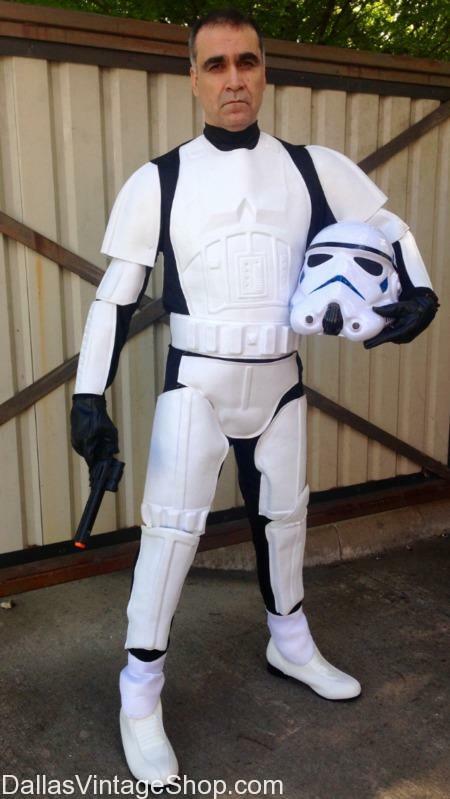 Find Star Wars Stormtrooper Costumes & many other Star Wars Characters, Villains and of course all the Iconic Action Heroes Outfits at Dallas Vintage Shop. This Ground Forces Shock Troop Soldier is your average, stereotypical Stormtrooper in White Costume. We have many other Star War Characters Costumes for Ladies, Men, Girls & Boys in a variety of price points. We are the Dallas, DFW & North Texas Costume Super Store. Get all your Star Wars Movies Characters Outfits or any other Blockbuster Sci-fi Movie Characters Costumes & Accessories here. If you need Cosplay Costumes, Action Characters, Hollywood Greats, TV or Movie Characters or Halloween Costumes for Theme Parties, there is no better place in Dallas or the DFW Metroplex to find complete outfits or just the Ladies Wigs, Men’s Wigs, Makeup and Accessories you need. We have this Darth Vader Star Wars Costume & Helmet in stock. Dallas Vintage Shop is the ‘one stop shop’ for all your Star Wars Characters Costumes in the Dallas, DFW & North Texas area. Get all your Star Wars Movies Characters Outfits or Star Wars amd other Cosplay Costumes for May The 4th Be With You Celebrations all over Dallas. We’ve got all you Star Wars Costumes & Accessories you need. 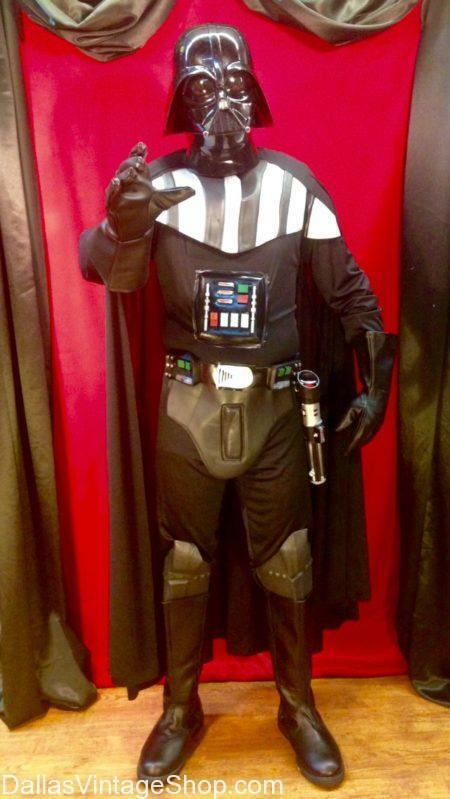 You will find this Darth Vader Star Wars Costume & Helmet anc other Star Wars Characters Outfits at Dallas Vintage Shop. We are the Dallas, DFW & North Texas Super Store for Star Wars Costumes. Look at our Child Darth Vader Costume in the Children’s Costume Ideas Category. Get all your Star Wars Movies Characters Outfits or any other Blockbuster Sci-fi Movie Characters Costumes & Accessories here. If you need Cosplay Costumes, Action Characters, Hollywood Greats, TV or Movie Characters or Halloween Costumes for Theme Parties, there is no better place in Dallas or the DFW Metroplex to find complete outfits or just the Ladies Wigs, Men’s Wigs, Makeup and Accessories you need. Who is your favorite Star Wars Character? Dallas Vintage Shop is the number one source for all Star War Characters in the Metroplex. We have many great Star Wars Complete Outfits like this Yoda, Jedi Master Costume & Mask. We keep stock on all Star Wars Costumes & Accessories all year round. 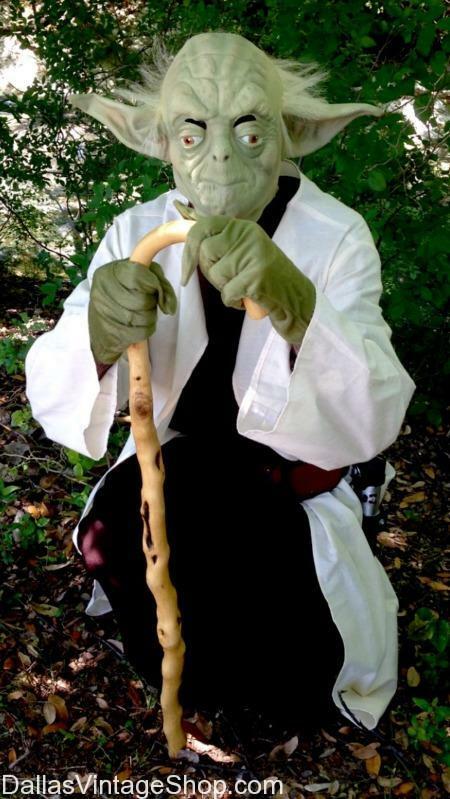 Here is a great Yoda Jedi Master Costume & Mask. Find many other Star Wars Characters Outfits at Dallas Vintage Shop. You will find Complete Yoda Outfits or just a variety of Yoda Masks for your Star Wars Costume Party. Get all your Star Wars Movies Characters Outfits or any other Blockbuster Sci-fi Movie Characters Costumes & Accessories here. If you need Cosplay Costumes, Action Characters, Hollywood Greats, TV or Movie Characters or Halloween Costumes for Theme Parties, there is no better place in Dallas or the DFW Metroplex to find complete outfits or just the Ladies Wigs, Men’s Wigs, Makeup and Accessories you need. We are the Dallas, DFW & North Texas Costume Super Store. 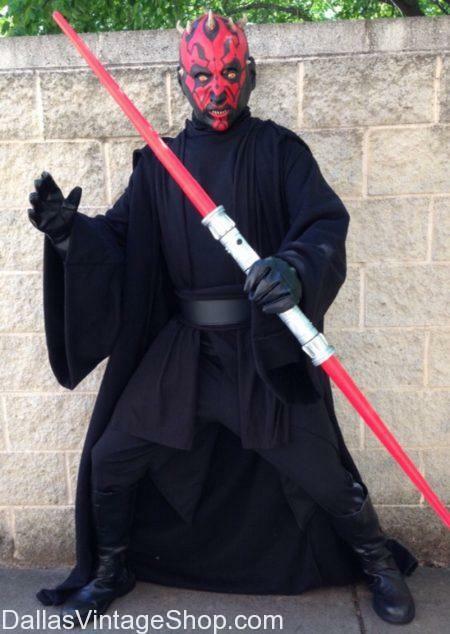 Check out this Darth Maul Sith Lord Costume from Star Wars Phantom Menace. You can get this cool Star Wars Villain Costume at Dallas Vintage Shop. We have this Star Wars Sith Lord Quality Costume or other Star Wars Characters Costumes in stock always. Our large selection of other Star Wars Villains or Heroes Costumes will amaze you. We serve the Dallas and all of the North Texas Area by providing all your favorite Star Wars Episodes Character Costumes. Are you ready for May the Fourth Be With You Star Wars Celebratios & Star Wars Theme Parties? This Darth Maul Outfit & Mask and the other Sith Lords are waiting for you here. Remember Darth Maul the Sith Lord from Star Wars Phantom Menace. We have the Costume & Mask and it looks fantastic. Find many other Star Wars Characters Outfits at Dallas Vintage Shop. You will find Complete Darth Maul Outfits or just the Darth Maul Masks for your Star Wars Costume Party. Get all your Star Wars Movies Characters Outfits or any other Blockbuster Sci-fi Movie Characters Costumes & Accessories here. If you need Cosplay Costumes, Action Characters, Hollywood Greats, TV or Movie Characters or Halloween Costumes for Theme Parties, there is no better place in Dallas or the DFW Metroplex to find complete outfits or just the Ladies Wigs, Men’s Wigs, Makeup and Accessories you need. We are the Dallas, DFW & North Texas Costume Super Store. Like this Queen Padme Amidala Star Wars Costume? We have this Star Wars Cool Padme Outfit in stock, along with so many others of your favorite Star Wars Movie Series Characters Outfits. If you need a killer Star Wars Getup for May The Fourth Be With You Parties or for Cosplay Costume Events we’ve got all you need. 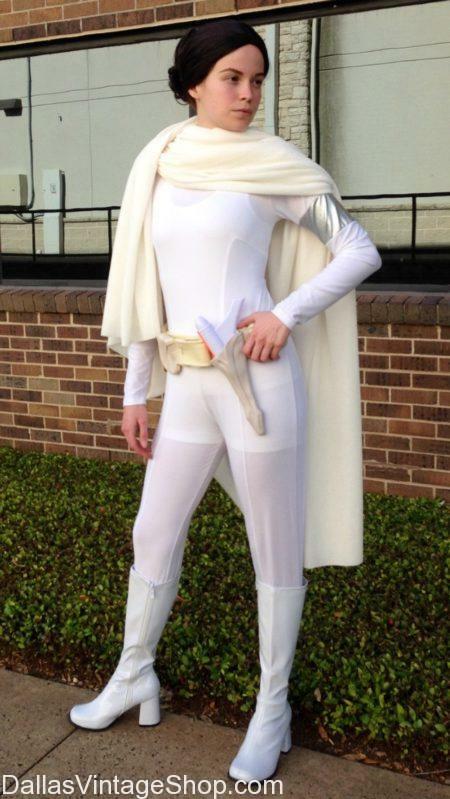 Look for this Queen Padme Amidala Star Wars Costume and many other Star Wars Characters Outfits at Dallas Vintage Shop. This is one of the many great Costumes we have in stock at Dallas Vintage Shop. We have tons of other Star War Characters Costumes for Ladies, Men, Girls & Boys in a variety of price points. We are the Dallas, DFW & North Texas Costume Super Store. Get all your Star Wars Movies Characters Outfits or any other Blockbuster Sci-fi Movie Characters Costumes & Accessories here. If you need Cosplay Costumes, Action Characters, Hollywood Greats, TV or Movie Characters or Halloween Costumes for Theme Parties, there is no better place in Dallas or the DFW Metroplex to find complete outfits or just the Ladies Wigs, Men’s Wigs, Makeup and Accessories you need. You are in Star Wars category.